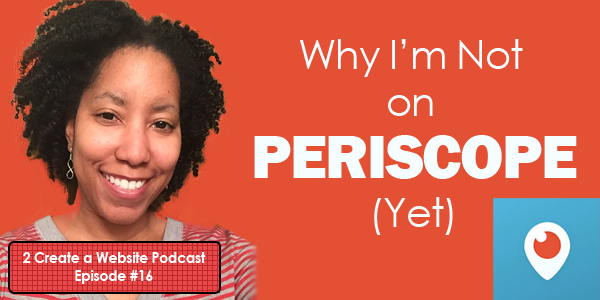 Why I’m Not on Periscope – Are You? Periscope is smoking hot right now! Bloggers and marketers are singing the praises of the budding app, and I’ve been asked why I haven’t started live broadcasting. After all, I’ve had some success with YouTube, so wouldn’t this live streaming video app be the next logical step for me? The truth is, I actually LOVE Periscope as a viewer, but haven’t done any broadcasts. I made a vow to myself when it comes to jumping on “the next big thing” online. You’ll have to listen to the podcast below to find out why I haven’t scoped, and how I will track the success (or lack thereof) when I do in 2016. Not into podcasts? No worries. I’ve got the transcript for ya right here. You can also download the mp3 (right-click and choose “Save As”) and listen later. So tell me. Are YOU on Periscope? If so, what specifically are you doing, and how is it helping your bottom line? Be sure to leave your name and strategy below so I can follow you! I’m really interested in following “scopers” who are using a consistent and trackable strategy. Also feel free to share names of people you enjoy following. I’ve always been following your videos and blogs. You help people blog in an awesome way ! 🙂 Can you please help me with something? I wanted to know if off-page seo still having the importance like before. The back linking techniques like guest blogging, article submission still considered as best way to rank a blog/website? Heya Sid! No. SEO has completely changed and all those old techniques are a waste of time. Google, unfortunately, continues to push small business sites down and push brands up — making it harder for smaller sites to rank. If you don’t have very strong links from other strong sites, it will be more challenging to rank for worthwhile keywords. I don’t even recommend buying keyword research software anymore. Hi Lisa, I’ve been follow you on Youtube since I’ve got interested in affiliated marketing. I am curious what scopers you have been following on persicope and why? Derek Halpern of Social Triggers is one of my faves. I like Darren Rowse of ProBlogger too. I started using Periscope mid January. Here is my scope name: The Tidy Tutor. I love using it and i can’t wait to see you on one of my Scopes! It takes some time to get used to, because it is a culture in itself and done very differently than other social media. I’m still figuring it out as far as how to engage, be polite to viewers and stay on topic all at the same time. Quantifying it is not the easiest thing to do, but I notice a great increase in enrollment in my primary organizing course since I’ve started. It is easier than doing a video – editing it- rendering it and uploading to YouTube because Persicope does most everything. For you. I repurpose the videos to YouTube and my blogs and it is the new direction I am going in. Not only am I finding new people but people who have been on my list forever are connecting with me who haven’t before. It’s just been a full month now- so I will get back to you after I crunch numbers and compare some things. Thanks for what you do. Awesome! Thank you for sharing such specific results. Will look for you on Periscope. I have seen a lot of people repurpose their content on YouTube as well. it took me a few video fails, but i think i finally have a system to where i minimize my rambling and give value to my followers. feel free to follow me on periscope: Nailah Harvey (nharvdotcom). I do not love Periscope, it takes away too much time. I hadn’t heard of Periscope so thanks for the link. I listened to the podcast and really enjoyed it. I will have to listen to more. Thanks again. Thank you so much Fearless. Have a great day and 2016! While I enjoy making You Tube videos, I haven’t even thought of using Periscope. I think it’s great when you have those moments an idea pops into your head and you want to get it out right then and there. But, I don’t see a use for it at the moment. I’m thinking of starting a podcast in 2016, which will be new for me. I currently do 10 minute take-a-ways where I record myself speaking about a business idea or strategy then play them back later on when I need some inspiration. Recording is more relaxing. The one thing that really annoys me with some users on Periscope is when they’ve started their scope and in the middle of saying something, they respond to someone just joining, which takes them off topic and breaks my concentration. I also hate it when they respond to trolls that bomb their feed. Merry Christmas and Happy 2016 to you! Looking forward to a new year of opportunities and growth! Exactly!!!!! OMG, couldn’t agree more about talking to people and getting off topic. There’s this guy who is very popular (and honestly I think it’s because he is handsome lol) but he takes forever to start and then he keeps talking to comments throughout the scope. It’s so distracting. I don’t mind people responding to a comment that’s relevant to what they are talking about but this guy will go off on a tangent and talk about a personal subject between the commenter that is not relevant to everyone else. I’m so glad they have a fast forward option now for the ramblers. Great to see you here Cynthia! Happy Holidays! Well I read your PDF and I agree with you as well. If I joined every single new site that’s come online since I started I would never have time to sleep. I told myself as well that I’m not jumping on everything and I’m tired of people asking me why I’m not. I haven’t watched a lot of periscopes but the ones I have I noticed that it was mostly rambling. I love when someone chats myself but only if I just have the time to waste. Trust me, I don’t right now so I’ve steered clear of them all. You’re smart to at least check it out and I’m sure you’ll find out soon enough whether or not it’s for you. I doubt I’ll join the rest of them though, I have enough to deal with as it is. Good luck and thanks for sharing this with us. Exactly! There are only 24 hours in the day and more and more things coming out. So some things we have to pass on. Yes, I know what you mean. Have a great Holiday and thanks for coming by. I just read this week that 2016 is going to be the year we start taking our sleep seriously. Here’s to the end of the exhausted blur in the name of staying current. Happy holidays to all. First, I totally feel you about rambling, I HATE that, get to the point already or I’m signing off. I really try NOT to do that on my podcast and with Periscope. I’m kind of a serial biz person. I’ve hosted a podcast for my fitness biz for 6 years and I manage several Periscope accounts so I’m on different ones or managing them. 2nd, have you tried Wishlist Member? I’ve used them on several sites and you gave complete control of your content and your pages and you can have parts behind the membership wall, where the course is and other pages that are outside. 3rd, I have 2 partners in success who I am dragging kicking and screaming into live streaming on periscope. We have a program going to help aspiring authors write, publish and market their business building book. We just launched our podcast in November and our strategy is to use Periscope to offer tips and strategies to getting the book done and answering questions live on the scope. Since its 3 of us, we are each going to broadcast 1 day (mon, wed, fri) and only for 15 min or so. Short, digestible scopes that give great value. And of course we are going to steer people to our free online video series. Good luck with everything and let me know if you have any questions about Wishlist Member. If you have the time…the discoverability factor is a valuable reason to use Periscope. . I discovered the remarkable Hilary Rushford of Dean Street Society and Nicole Walters aka ScOprah on Periscope. Between you, Nicole and Hilary I have just enough actionable inspiration and lessons that I need to keep moving forward connecting the dot -checking items of Do List. Byron in Calif – your newest raving fan! Hey Byron, gonna check those people out. Thank you! I think you could use periscope to broadcast yourself while you are recording podcasting. You could also use it while you are recording a webinar. All your followers who are not on the webinar call sees this and then go to your webinar or podcast. You could also create a five minute morning broadcast which may also lead to increased subscribers. Just some thoughts. BTW you can get free/cheap webinar software at https://expertise.tv/. I’d love to get your opinion on this site. Thanks for the tips and ideas! I am not the one to follow something blindly. Periscope to me just looks like another fad which bloggers have got obsessed with. I did rather spend that time on doing something more constructive because I am not comfortable with being in front of the camera so much. I didn’t know you have a podcast now. I will subscribe for sure. I think we should do something because everybody is doing it. We need to find which platform we like to present ourselves. I like to idea of personalizing depends on our situation and need. We don’t have to be everywhere. We can’t! I have been playing around with Periscope for the last few weeks. I do enjoy seeing what others are doing with it, but I don’t feel it is something that I want to do personally. I don’t enjoy being in front of the camera. I am trying to figure out how to incorporate it into my business. I used to livestream a lot on services like Ustream and Livestream when I first started my first blog 7 years ago to connect with my audience as streaming in itself was a fairly new thing. YouTube and YouNow hadn’t even started their own services and they seem to be the most popular ones on desktop devices. I’ve used Periscope a handful of times so far just to watch a couple of scopes by fellow bloggers in the lifestyle & travel industry I’m in. I’ll admit its a great way to connect with your audience in a personal capacity and I can’t see any of the bloggers in my niche using it to promote their own individual products at the moment. However, I do enjoy the concept as you can watch content in a live or recorded capacity. Following from what you said in your podcast, I’ve viewed Darren Rowse’s scopes in the past as he shares tips about blogging and using social media for business etc. Personally, I see it as being an extension of Twitter – connecting & interacting with your audience, answering their questions etc, rather than being limited to a 140 character message. Long time no see. Good to see a comment from you. Yes, I can totally see it as an extension of your business and adding another personal touch, but I want to take it to the next level. I’ve always joined social networks without a real strategy and this time I want to to try something new. I have recently got on Periscope, but I have only made one broadcast and it lasted for about a minute and a half. I shared what I wanted to share, and admitted it was my first scope. I liked it, but I don’t see myself investing much time in it, right now. I am a lot like you in that I don’t want to use a social media network because it is new and shiny. I do like it, but I think I am more inclined to watch rather than live stream. I follow a lady on You Tube (Embrace Natural Beauty) who actually uploads her scopes to You Tube and I watch her scopes that way. I skip over the rambling. 🙂 I don’t have much patience either and I like for people to get to the point. I don’t know if I will use Periscope for marketing purposes because I like control meaning, I like to edit my videos which helps me get to the point. Plus, since I’m already on You Tube, when I want to live stream, I’ll use You Tube for that. Thanks for sharing and Happy Holidays!! Completely agree Evelyn! Thanks for coming by. Hey Hey Heyyy there Lisa! Wow! Great podcast ladybug. I have been thinking about hopping on the Periscope train as of late too, but I am not really sure about it. I am an extreme introvert, but I am ready to start really putting myself out there to get more exposure and drive traffic to my new blog. As you stated, I believe that it’s all about having a solid strategy in place for using these different platforms vs chasing the latest fad — aka shiny object syndrome. Believe it or not I am an introvert too. Actually, I am more of an ambivert — in other words I have traits of both an extrovert and introvert. That often surprises some people because I love doing YouTube. But there is a comfort with recorded things versus live, and it’s time for me to also step out of my comfort zone. So I totally get you on that! But the more I brainstorm ideas for Periscope and get closer to finishing the courses I’m creating, the more excited I get about next year. I’ve been wanting to host my courses for so long but keep going back and forth with the plugin/platform. The video Ileane shared below was so helpful, and I’m even more excited about 2016! Appreciate you stopping by. See ya on Twitter! You definitely got to the point, thank you for all the tips. I’ve used Periscope and I think it would be a great platform for you. However, what I’m really interested in is getting you to join me over on Blab! You will really love that one. I did a couple of Blabs with Leslie Samuel and it was so much fun. The difference with Blab is that you get to have a “conversation” versus Periscope which is more of a broadcast tool. Take care Lisa! Hope to see you on Blab soon. Heeeeey to my social media pro! Yes, the same goes for Blab. I’m certainly open to that one too. Really appreciate you sharing that link to Kim’s post because, as I said in the podcast, I’m not 100% sold on Sensei yet. Still in the research phase, so I’m looking at everything.